Because of its sheer variety of landscape and townscape, as well as its climate without extremes, Scotland offers a huge range of things to do. Mountain biking, sea kayaking, quad biking - wait a minute - do I really have to list them all? Let’s say from the comparative everyday activity of hiking to extremes such as bungee-jumping, it’s all here. Gosh, don’t I sound like an activity holiday advertisement? Sorry. But on the other hand, there are hundreds of other high hills that you can climb in a day without experiencing a twinge of fear! Then there are thousands more lower-level walks, many of them sign-posted. There are several ‘official’ long-distance footpaths, including the famous West Highland Way and the less well-known Dava Way. Then there are coastal footpaths such as the Moray Firth Trail or the Berwickshire Way. The Forestry Commission, the government body charged with growing commercial timber, positively encourages you to use its forests for recreation. Signposts and trails galore. And, in any case, enshrined in legislation is Scotland’s ‘right to roam’. You can walk wherever you choose basically - though that comes with responsibility. And there’s a huge choice. So, on your visit, bring a decent pair of shoes, will you? Oh, and here's a favourite walk of ours: we reckon it's the best walk in the Great Glen with lots of scenic and historic interest. Follow that link for more information! Cyclists may notice that Scotland isn’t flat. Sometimes the wind blows, usually originating from the destination toward which you want to pedal. You may also have heard rumours of rain (exaggerated). On the other hand, Scotland has some ‘lightly trafficked’ country roads. Scotland also has more than 2000 miles of National Cycle Routes. So, almost in spite of the terrain, Scotland is fairly cyclist friendly and reasonably well resourced (though you can see some terrifying sights as riders mix it with rush hour traffic in certain Scottish cities). There are lots of parts of Scotland that are decidedly horsey, including, say, Scottish Borders, Perthshire or Aberdeenshire and Moray. There is an enthusiastic following in Scotland and facilities are very good in terms of riding and trekking centres. A good range of hacking options and riding trails – in some cases signposted – are available. Scotland is also the home of native breeds such as the Highland and Eriskay ponies and it is said that the pastime of pony-trekking was first introduced on Speyside, as a way of using the native ponies outside the deerstalking season. The ponies are otherwise used to bring dead deer off the hill. I suppose deer stalking should also be on the list of things to do in Scotland, though it might be simpler to re-introduce wolves and let them get on with deer management. OK, to be honest, when I took this picture there were two guys in chest-waders further downstream but as everybody knows what an angler looks like, here's a picture of the River Tweed where it is spanned by the Leaderfoot Viaduct. Closed to rail freight traffic in 1965 (passenger traffic having ceased in 1948) it is now in the care of Historic Environment Scotland. It's 126ft (38m) high and is an A-listed building. And more interesting than a man in chest waders. Trust me. The image of the waist-deep angler flicking the fly across the rolling waters of some fine Scottish river is more or less iconic. Upmarket angling is one of the classy things to do in Scotland. There are a lot of anglers on a lot of famous rivers. But it isn’t all about expensive beats with salmon as the quarry. 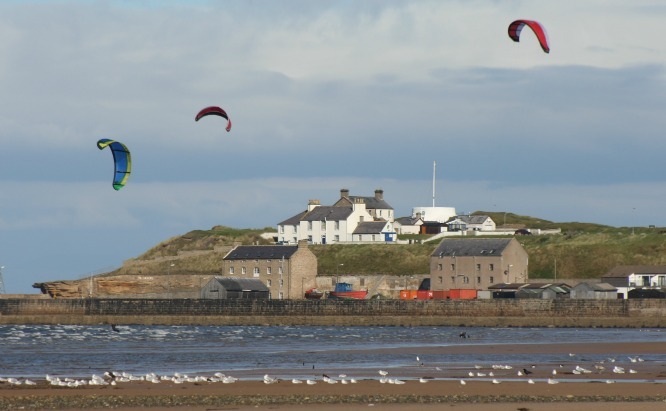 Aside from the fame of the River Tweed or the Dee, Don or Spey, there are lots more, some with names you might not have heard of - like the Deveron or even the Ugie. And all this before we even start on the lochs. Salmon, sea trout, brown trout - wild fish...or go for the stocked rainbow trout on managed waters. Seek local information, get your permits from hotels, or the local village shop. There are plenty of accommodation packages and fishing holiday companies available too such as Fishpal. 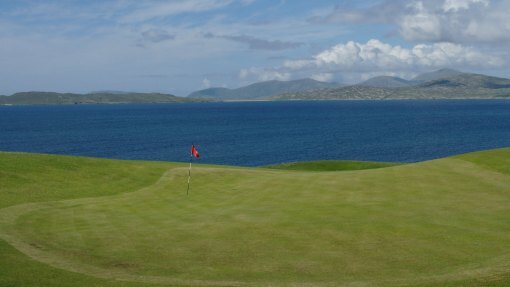 Isle of Harris golf club, at Scarista. Well, what can I say about golf in Scotland? It’s usually pretty democratic, for a start. Sure, there are exclusive clubs. Links, parkland, moorland...classic Scottish golf. Packages galore are available, sometimes tied in with local hotels. Hidden gems or famous names, Scotland still promotes itself as the ‘Home of Golf’. Everybody knows that, don’t they? Whooper swans from the hide at the Loch of Spynie, near Elgin, Moray. In any list of things to do in Scotland, the promise of seeing some wildlife spectacle is promoted quite hard: for example, dolphin and whale-watching trips. Otherwise wildlife isn't always ‘in your face’. But if you take a look at our page on Scottish birds or our other wildlife pages, you will see that there are some pretty special sights to see. The gannets of the Bass Rock are a world class spectacle; roaring red deer in the autumn are very atmospheric; flights of over-wintering grey geese likewise. The Moray Firth bottle-nose dolphins are famous but mostly wildlife encounters in Scotland are more intimate: a red squirrel on the bird feeder; otters unexpectedly on the tide line (though I know of one west coast posh loch-side hotel where they can be viewed from the dining table); or an encounter with a sea eagle on, say, Mull or Skye. But take the telephoto lens and binoculars anyway - after all you only have to see the number of wildlife reserves looked after by conservation bodies such as the RSPB or SNH to work out that wild Scotland is well worth exploring. Malt whisky distilleries are mostly found in Highland Scotland, with the valley of the River Spey as a major centre, and also on the island of Islay off the west coast. However, no matter where you go in Scotland and want to find out more about Scotland’s national drink, then there should be a distillery within reach. Many (but not all) have custom-built visitor centres and offer tours and tastings, often an audio-visual presentation, and usually a café and shop where you can buy the malt whisky at the place of its birth. Plus many now offer detailed tasting sessions when you learn in-depth about blending and nosing - often creating your own sample blend to take home! Inverewe Gardens, Wester Ross. The vegetables need the rain. Scotland has a great tradition of gardening and horticulture – partly through the work of generations of Scottish plant-hunters, such as David Douglas and George Forrest. They went abroad to bring back new species and give their names to many familiar garden plants of today. So any list of things to do in Scotland certainly has to include garden visiting. Scotland’s cool maritime climate favours a very wide range of plants. Just one noted speciality is the magnificent rhododendron and azalea species that thrive here, far from their native Himalayan or Chinese homelands. There are many notable collections, including those at the Royal Botanic Gardens in Edinburgh and also at Brodick Castle on the island of Arran. The benign influence of the Gulf Stream also allows many other tender species to thrive at places like Inverewe in the north-west Highlands, and Logan Botanic Gardens in Galloway. The National Trust for Scotland have many gardens in their care, including the famous Crathes Castle near Aberdeen, while another way for visitors to see the finest collections in private ownership is to view the private gardens open on selected dates through Scotland’s Gardens Scheme. Harvey Nichols from St Andrew Square, Edinburgh. Glasgow is Scotland’s largest city and a major retail centre, statistically speaking, in UK terms. All of Scotland’s cities have 21st (or late 20th) century covered shopping malls with the usual UK-wide ‘High Street’ names - in the smaller cities it’s the Eastgate in Inverness, the Thistle Centre in Stirling, St John’s in Perth and so on. But it’s aside from these high profile places that the most interesting shops are to be found - say: Byres Road and, to a lesser extent, the Merchant City for Glasgow; Stockbridge or Morningside in Edinburgh; Belmont Street and its surroundings for Aberdeen - just as a few examples. Then there are towns where reasonable numbers of little shops survive: Newton Stewart in Galloway; Kelso or Peebles in the Scottish Borders; Aberfeldy in Perthshire, St Andrews in Fife...and then places as disparate as Oban, Kirriemuir, Huntly, Linlithgow, Crieff, Elgin and several more - all worth a stroll around. We like Stromness and Kirkwall in Orkney too. That comment aside though, speciality jewellery is popular, cashmere and lambswool too - and at the cheaper end shortbread and speciality Scottish biscuits - anything with oats! ; while Scottish-themed art is also popular - see our comments on this on our Isle of Harris page. And talking of Harris, yes, tweeds out there are the thing to take home - and, if you ask us, we can even point you to a local lady in the Outer Hebrides who makes Harris tweed collars and dinky leads for wee (or not so wee) doggies. So, whether you barely get further than the outlets at Loch Lomond Shores, Balloch, or track down the bookshop Achins at Inverkirkaig, far into the North West Highlands, shopping is definitely included in any list of things to do in Scotland. Visiting Scotland's preserved / heritage railways. Ballooning, diving, hang-gliding, surfing, sailing, skiing, water-skiing, sea kayaking and being rolled downhill inside a giant plastic sphere-thing (yes, really, people do want to feel like hamsters) - you can find them all and more. There are a whole lot of activity providers who are just waiting to show you how. Your starting point for things to do in Scotland should be the Activity Scotland website. And one more thing: ancestry research is a whole other area that attracts interest in Scotland, because of the size of its diaspora. We are really well resourced if you are thinking of tracing your family tree in Scotland.